A Season of Thanksgiving: Why Start Now? I’d like to spend the next few days focusing on Thanksgiving. That’s right, Thanksgiving. Yes, I know that the official American holiday falls on the fourth Thursday in November, not the third Monday. So, yes, I know that I’m a week early. But I’d like to begin to offer some thoughts on Thanksgiving, even though we won’t be sitting down to a Turkey dinner for another 240 hours or so. Why start a conversation about Thanksgiving now? I do not mean in any way to undermine the specialness of the traditional holiday. I think it’s great that the United States continues to set apart a day a year for giving thanks. And I think it’s doubly great that most of us still believe that Thanksgiving is a day for actually giving thanks to God, not just a time for feeling nebulously thankful while filling our faces with a Turkey dinner and watching football on TV. My hope is that by writing about Thanksgiving a week and a half early, I might actually enhance your celebration of Thanksgiving, not detract from it. Thus, today’s post will be the first of several on giving thanks. There is a danger, I believe, in identifying one day a year as Thanksgiving Day. It’s the danger of implying that thanks is due on this day, but not on others. We face a similar danger, for example, when we designate the second Sunday in May as Mother’s Day. Shouldn’t children honor their mothers more than once a year? Similarly, shouldn’t we be thankful more often than once a year on the fourth Thursday of November? As a Christian, I would argue that giving thanks to God is important because it honors God. I would also argue that Scripture calls for consistent gratitude among God’s people. But, there is also case for gratitude that doesn’t depend on biblical theology. In fact, it appeals to common sense and even self interest. To put the matter bluntly: Gratitude will improve your life. Gratitude magnifies our experience of the good things in life, enabling us to enjoy them more thoroughly. Gratitude also helps us to endure the hard things in life with dignity, perhaps even with humor. Gratitude is like savoring a fine meal, enjoy every bite, rather than racing through a meal as if it’s some sort of race. Let me offer a person example of what I’m talking about here. I was able to go to college because I received generous financial aid. My father had been unemployed for several years so our family resources were limited. 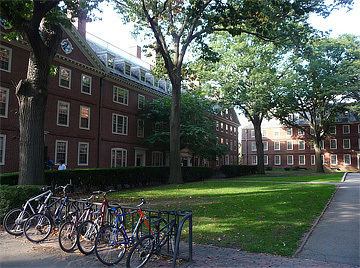 Harvard expected me to earn a fair amount of money through working, both during the summers and the school years. I was also required to take out a reasonable loan. But the majority of my tuition, room, and board was covered by a grant from the school. This was not a merit-based scholarship, I might add. I’m not bragging here. Harvard’s assistance was based on financial need, of which I had plenty. During my first fall in college, I received a letter from the financial aid office informing me that there was a special fund for students who needed to buy a winter coat. If I would show up at the financial aid office at certain designated times, I would receive some extra funds to help me get ready for winter. I thought this was amazing, and I did need a winter coat. So I arrived at the appropriate office at one of the identified times. I joined the end of a line that might have included 25 other freshman students. Calculating how long it took each student to get their share of money, I figured I would be in line for a half-hour to an hour. That was just fine with me. After all, I was getting free money for a new coat. As I was standing there, I felt waves of gratitude. I was thankful for the privilege of being part of a university that cared about my physical well-being. I was thankful for donors who had given money to support this effort. I was thankful to God for his multiple blessings on my life. I was shocked. I couldn’t believe his sense of entitlement and ingratitude. Such attitudes were not only rude and selfish. They were also stealing his joy. There I was, with my heart warmed by thankfulness, whereas this other student was groveling in anger and resentment. I realized that I was so much happier than he was, and I even felt thankful for the ability to feel thankful. Those of us who go through life like that ungrateful student are simply missing out on so much joy. We are cheating ourselves, not to mention those who have been gracious to us, including God. But we are also cheating ourselves, big time. As we approach Thanksgiving Day, perhaps you and I ought to step back and consider our attitudes. Are we like that ungrateful student? Or are we allowing thankfulness to enrich our lives? Why not start giving thanks today? You don’t have to wait a week! In just a few days, Americans will celebrate Thanksgiving Day. Yet for many of us, the actual holiday is so full of activity that we have little time for intentional, extended giving of thanks to God. So, as has been my tradition for many years, I am putting up several posts in anticipation of Thanksgiving Day in order to encourage my readers to let this be a season, not just a day of gratitude. When you think of Thanksgiving, what images come to mind? Roast turkey? Pumpkin pie? Watching football with your family? Perhaps the Macy’s Thanksgiving Day Parade? 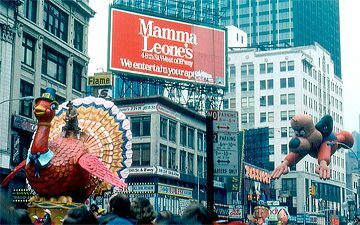 A scene from the 1979 version of Macy’s Thanksgiving Day Parade. Notice Underdog in the background. Photo from WikiCommons. I grew up watching this parade on television, marveling at the giant helium balloon representations of Underdog and Bullwinkle, and waiting for Santa to appear to kick off the Christmas shopping season. Then, in 1982, I had the privilege of spending Thanksgiving Day in New York City. Of course, I had to see the Macy’s Parade in person. There, standing next to Central Park, I watched the bands and giant balloons from only a few feet away. I discovered that it was a lot colder watching the parade in person than from the comfortable vantage point of my living room. But plenty of hot coffee kept me going through the whole spectacle. That evening some friends and I had Thanksgiving dinner at the Helmsley Palace Hotel. (Yes, the one once owned and managed by the infamous Leona Helmsley and her husband. It’s now called the New York Palace.) We arrived an hour before our prearranged sitting and enjoyed appetizers in the hotel bar. It was the most elegant place I had ever enjoyed a drink and some peanuts. And, believe me, I paid for every inch of elegance. Thanksgiving dinner was served in the fabulously ritzy dining room. It was one of the most over-the-top meals of my life. But, no matter the grandeur of that Thanksgiving meal, it still wasn’t quite right. After all, for me, the heart of my Thanksgiving holiday wasn’t going to parades or eating lavish meals. It was about sharing a day with family, and mine was 3,000 miles away in Southern California. The best tasting turkey in the most opulent dining room didn’t satisfy the real longing of my heart – to be home. I wasn’t the only one who felt such a longing. In fact, the Thanksgiving weekend is the busiest travel weekend of the year. Around 40 million people each year travel more than 50 miles in order to share Thanksgiving dinner with their families. Several years ago, the Bureau of Transportation Statistics estimated that the average Thanksgiving traveler covers 214 miles. Talk about a yearning for home! If you think about it, however, the actual events of Thanksgiving Day can be rather underwhelming. In addition to watching the Macy’s Parade, tens of millions of people watch football, while tens of millions of people cook mass quantities of traditional food. Then they all get together to eat more than they should, only to top off their gluttony with pumpkin or mince pie. Then there’s clean up, a bit more TV, and that just about sums up the day for many of us. It’s more about armchair quarterbacking and eating voraciously than our hearts, even though there’s can be something wonderful about just being with your family. A college friend of mine named Jeff decided one year that his family’s Thanksgiving was far too secular. It needed some real gratitude, he thought. So Jeff, as a new Christian, volunteered to say the blessing before the meal. It was usually done perfunctorily by the most religious of his uncles, which wasn’t saying much in Jeff’s family. But Jeff was going to redeem Thanksgiving once and for all. When it came time to pray, he started by thanking the Lord for the family’s many blessings. Then he turned to larger issues, expressing gratitude for freedom, for our country, and so on. Finally, Jeff got explicitly religious, using his prayer as an opportunity to evangelize his godless relatives. After about five or six minutes, these godless relatives were about ready tar and feather Jeff. Concerned, his mother tapped his arm and said softly, “Honey, don’t you think it’s time to eat now?” In response to this, his slightly religious uncle yelled, “Amen!” Jeff’s family immediately dug into the turkey, leaving Jeff somewhere mid-sentence. Don’t worry. I’m not going to ask you to give up any of your prized Thanksgiving traditions. Go ahead and watch the parade and the games, if you wish. Drive several hours to grandma’s house and back. Eat way too much turkey. Take a long nap. Or whatever. These can be delightful traditions. But I am going to ask you not to forget the heart of Thanksgiving. In fact, I’m going to encourage you to let Thanksgiving be more than just a day. Why not take time during this week and next to remember God’s blessings and thank him for them? If your Thanksgiving Day is already full with family folderol, then set aside some time on the day before or the day after to remember all that God has given, and to say “Thank you.” Better yet, do this for several minutes each day this week and next. If you do, not only will you be doing the right thing, since God deserves thanks for all he has done for you, but also you will find that your celebration of Thanksgiving is richer and fuller than you have imagined it could be. In fact, you might just discover that your overall happiness with life improves. Expressing heartfelt gratitude to God is one of life’s greatest joys. It’s a joy that many of us rarely experience. And it is the true heart of Thanksgiving. So let me invite you – yes, urge you – to take time in this season of Thanksgiving for real expression of gratitude to God. You’ll be glad you did. 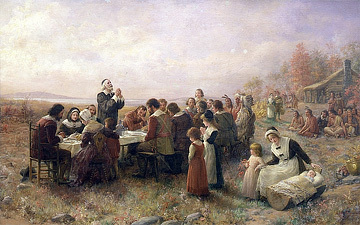 For several years, it has been my history to put up a bit of Thanksgiving history a few days prior to the holiday. 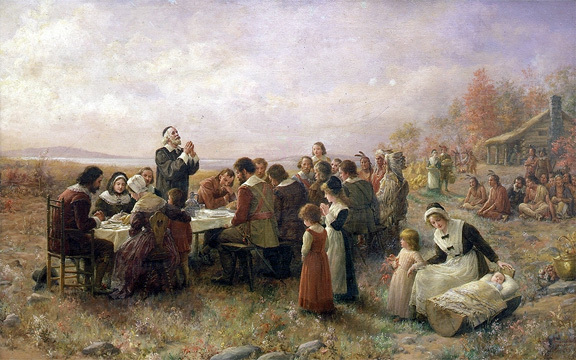 So, once again, here is a brief history of Thanksgiving. Several years ago I asked my six-year-old nephew, “On Thanksgiving, to whom do we say thank you?” He quickly responded, “To the Native Americans.” (No, I’m not kidding.) “Do we say thank you to anybody else?” I queried persistently. “To the Pilgrims.” “And to anybody else?” I prodded further. “To God!” he exclaimed. The idea of a permanent, national celebration each November came 242 years after the first Pilgrim-Indian festival in the early 17th century. During the Civil War, many Americans clamored for some sort of national religious holiday. One of the most vocal was Sarah Josepha Hale (who, by the way, wrote “Mary Had a Little Lamb”). Hale used her clout as editor of the influential Godey’s Lady’s Book magazine to motivate President Lincoln to proclaim a national holiday. 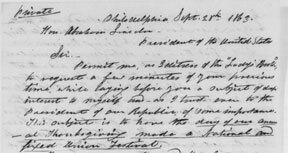 On September 28, 1863 she wrote a letter to the President encouraging him to “have the day of our annual Thanksgiving made a national and fixed Union Festival.” Five days later Lincoln issued the “Thanksgiving Proclamation of 1863” (which we’ll examine below). In his proclamation, Lincoln set apart the “last Thursday of November” as “a day of thanksgiving and praise to our beneficent Father who dwelleth in the heavens.” Throughout the next eight decades, all American Presidents followed Lincoln’s example. But during 1933, as the Great Depression raged, many merchants appealed to President Franklin D. Roosevelt to change the day from the last Thursday in November to the fourth Thursday. The reason for this request? November, 1933 had five Thursdays, which left the minimum number of shopping days between Thanksgiving Day and Christmas Day. Roosevelt denied this request, leaving the holiday on the last Thursday of the month. But in 1939, the next five-Thursdays-in-November year, President Roosevelt gave in to the requests of business owners and established the fourth Thursday of November as Thanksgiving Day. National chaos ensued, with some states following Roosevelt’s lead and others sticking with the traditional last, and in this year, fifth Thursday. This meant, among other things, that families living in different states were in many cases unable to celebrate Thanksgiving together. The national controversy over the day of the holiday continued, until Congress passed a law on December 26, 1941, making the fourth Thursday of November the one, official, national day. 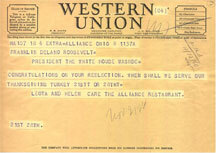 One of many critical communications Roosevelt received in light of his controversial Thanksgiving decision. This telegram, written in November 1940 by two restaurant owners reads: CONGRATULATIONS ON YOUR REELECTION. WHEN SHALL WE SERVE OUR THANKSGIVING TURKEY 21ST? OR 28TH? Recalcitrant Canada, I might add, does not recognize the fourth Thursday in November as Thanksgiving Day. I learned this the hard way while in college. Some friends and I decided to celebrate Thanksgiving by driving from Boston up to Montreal. It didn’t dawn on us that Canadians celebrate their Thanksgiving on the second Monday in October. This wouldn’t have been so bad, except that the restaurant in which we had our Thanksgiving dinner didn’t even have turkey on its menu. I had to settle for quiche, of all things. Now that’s a Thanksgiving travesty, from a narrow-minded American perspective, I might add. I want to close by printing the text of Lincoln’s original Thanksgiving proclamation. I won’t add my own comments. But I will italicize a few sections that strike me as especially profound. As you read this proclamation, you might ask yourself: What would happen if an American President used this kind of language today in an official proclamation? What in this statement speaks to the heart of our national crisis today? It has seemed to me fit and proper that they should be solemnly, reverently, and gratefully acknowledged, as with one heart and one voice, by the whole American people. I do therefore invite my fellow-citizens in every part of the United States, and also those who are in foreign lands, to set apart and observe the last Thursday of November next as a day of thanksgiving and praise to our beneficent Father who dwelleth in the heavens. And I recommend to them that while offering up the ascriptions justly due to Him for such singular deliverances and blessings they do also, with humble penitence for our national perverseness and disobedience, commend to His tender care all those who have become widows, orphans, mourners, or sufferers in the lamentable civil strife in which we are unavoidably engaged, and fervently implore the imposition of the Almighty hand to heal the wounds of the nation and to restore it, as soon as may be consistent with the divine purpose, to the full enjoyment of peace, harmony, tranquility [sic], and union. A Season of Thanksgiving: Be Sure to Thank People Too! I’ll never forget something I heard at the baccalaureate service that was part of my graduation from college. 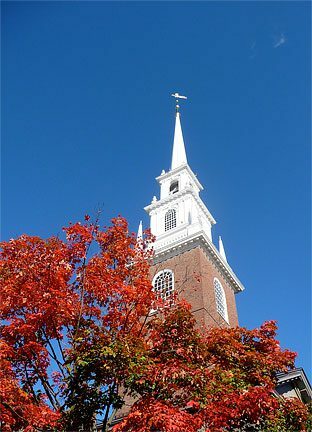 As I sat in the Memorial Church of Harvard University, the President of Radcliffe College (part of Harvard) said something like, “The baccalaureate service is a traditional ceremony of thanks and praise.” Wow, I thought, that’s surprisingly good! 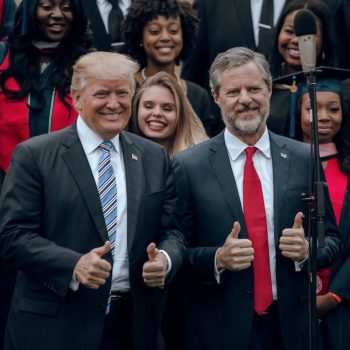 But then the President continued, “So, on this day, we keep the tradition of baccalaureate by thanking you for being part of this university and praising you for your outstanding achievements.” Oops! She got the thanks and praise part right, but rather confused who receives them. The traditional baccalaureate service features thanks and praise to God, not the graduates! Similarly, the primary purpose of Thanksgiving Day is to express gratitude to God for his many gifts. Although sometimes this gets forgotten in our secular culture today, still most people realize that our thanksgiving should be directed primarily in God’s direction. However, this season of year also gives us a chance to say thanks to people . We can express our gratitude to those in our lives for whom we are grateful and who sometimes don’t get to hear this from us very much. As long as I’m thanking the Lord for my wife and my children, for example, doesn’t it make sense for me to tell them? Imagine how you’d feel to hear this from someone important in your life. My guess is you’d feel honored, happy, maybe a bit embarrassed, and even thankful. It’s a wonderful thing to hear that someone is truly thankful for you. In fact, it’s one of the best feelings in life. Thanksgiving provides a salutary occasion for saying thanks, both to the God from whom all blessings flow and to those who are conduits of divine blessings in our lives. It’s a time to stop what we’re doing and say “Thank you” to the people in our lives who deserve to hear this from us. Even if you manage to thank only one other person this Thanksgiving, that small gesture can make a big difference in the life of that person. So, may I encourage you to use the occasion of Thanksgiving to thank the people in your life who matter to you. Tell them that you’re thankful for them. Drop someone a note. Or make a short phone call. If they’re under twenty, you can even text them! Telling people that you’re thankful for them will enrich your life as well as the lives of those for whom you are grateful. In today’s blog post, I want to share with you a short, online meditation, a little sermon, if you will. It is based on one of the more familiar and beloved passages of Scripture, the story of the healing of the lepers in Luke 17:11-19. This is one of those Bible stories I’ve heard since I was a preschooler. The main lines of the story are very familiar: Ten lepers call out to Jesus for mercy. He sends them to the priests and when they go they are miraculously healed. But only one of the men comes back to thank Jesus. The moral of the story? We should be like the man who came back. We should thank Jesus for his mercy in our lives. Now that’s a fine moral. It’s surely right. But I think it misses something wonderful. This story, I believe, isn’t only about being thankful. Rather, it’s an invitation to something even more wonderful. 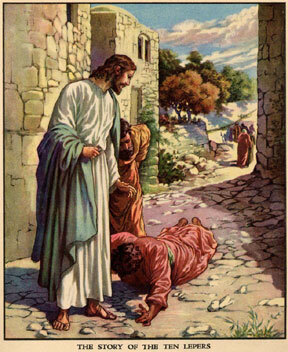 Jesus didn’t immediately heal the lepers. Rather, he told them to go to the priests because he knew that they were about to be healed. According to the Jewish law, a priest had the sole authority to determine if and when a person with leprosy was made clean. If a priest found a person to be healed, then the priest would make sure the appropriate sacrifices were made. Moreover, the priest’s endorsement allowed the cleansed leper to return to human society. Notice that the lepers actually did what Jesus told them to do by going to the priest. This shows that they had quite a measure of faith in Jesus. If they didn’t believe that he had the power to heal, they certainly wouldn’t have gone to the priests. Moreover, the lepers obeyed Jesus. Sometimes we forget this when we read this story. But, in fact, the nine who were healed not only had faith in Jesus, but also they did what he had told them to do. Before we start criticizing the lepers for their selfishness, we should notice that they are examples of faith and obedience. Yet, as the story develops, we realize that the nine lepers who believed and obeyed Jesus missed something essential. They missed the chance to say thanks to Jesus directly. They missed the relationship that should come in the context of believing and obeying Jesus. The nine who didn’t return to Jesus might even have felt grateful for their healing. In fact, I expect they did. But what they missed was the intimate encounter with the Lord, the chance to fall at Jesus’s feet and thank him directly and personally, the chance to know him personally. 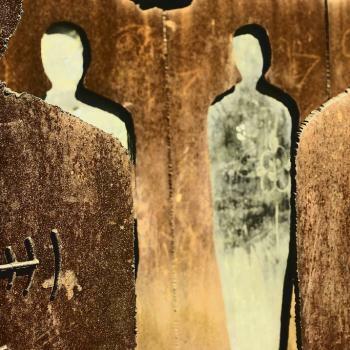 Can you see yourself in the nine lepers who didn’t return? At least a bit? I certainly can see myself here. Like the nine, I have put my faith in Jesus. I have believed him. And I do want to obey him. If he says something like “Go to the priests,” then I’m on my way. Faith and obedience . . . these are central to my Christian faith. And surely they should be! But what can I miss sometimes? I can miss relationship with Jesus, the intimacy that comes from falling at his feet in gratitude. I can be so eager to charge on to the next act of obedience that I can forget about taking time just to be with Jesus. When this happens, I miss out on one of the greatest joys of life. And Jesus misses out on relationship with me. No doubt the story of the leper who came back reminds us to be thankful for God’s blessings in our lives. By all means, be sure to thank the Lord for his goodness to you. But this story also reminds us that the Christian life is more than accepting Jesus as your Savior and then obeying him, though these are absolutely essential, of course. Besides faith and obedience, Jesus invites us into an intimate relationship with him. Saying “Thank you” is more than something we should do to be polite. Indeed, thanksgiving opens up our hearts to know Jesus more truly and personally. When I take time to stop and think about what God has done for me, I find my heart softening. I find my love for him growing. I find my desire to be with him increasing. Gratitude, when I let it pervade my heart, leads to intimacy with the Lord. So, in this season of thanksgiving, let us indeed offer to the Lord the thanks he deserves from us. But let’s also allow our thanks to draw us near to the heart of God. May our thanks lead us into praise. May it draw us to adoration. May this Thanksgiving be a time for you, not only to say “Thank You” to God, but also to enjoy his presence, even as he enjoys yours. May our gratitude fill us once again with love for God! On a recent trip to New York City, I joined my son, Nathan, for a walk/hike through Van Cortland Park. 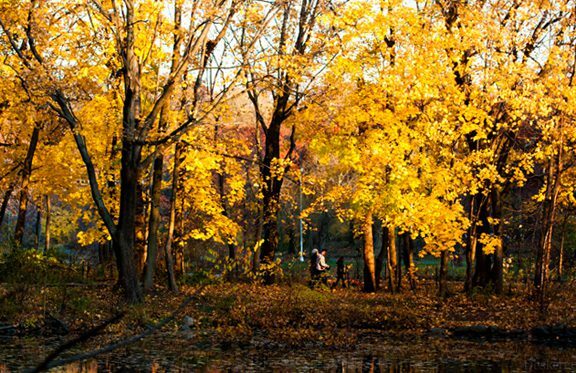 This park of more than 1,000 acres is in the northwest Bronx. It’s accessible from Manhattan by subway. 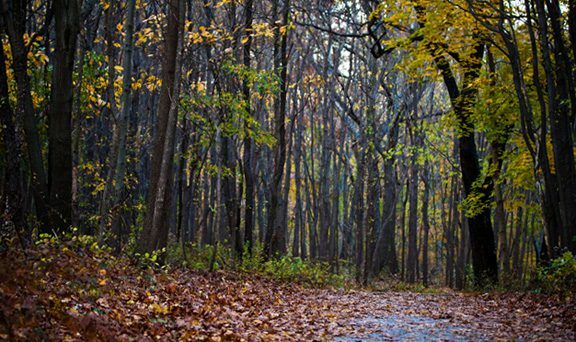 And, though it isn’t far away from civilization, Van Cortland Park offers some restful, beautiful woodland paths. Today, I’m thankful for the beauty of nature, especially the stunning colors of autumn. 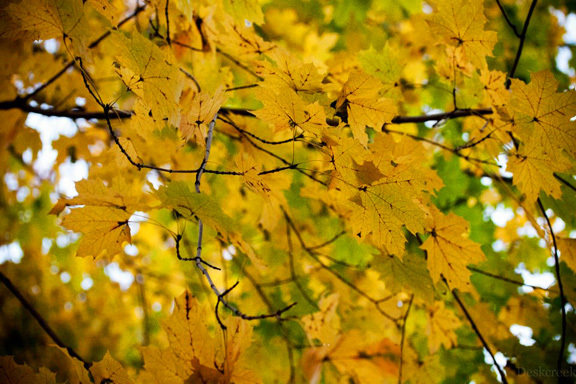 In early November, the red leaves have mostly turned to brown, but the yellows and golds are striking in their vividness. 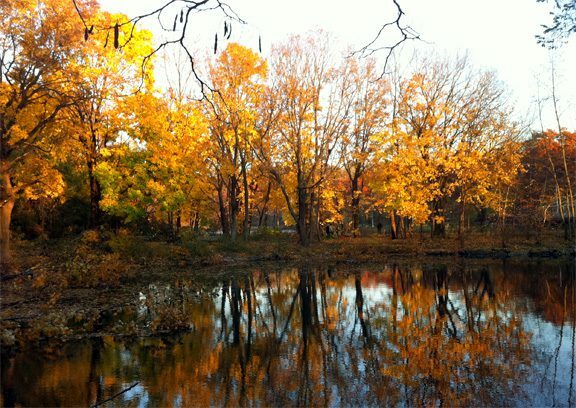 The following pictures of Van Cortland Park were taken by Nathan, whose photographic skills far exceed those of his father. I managed to snap this next photo with my iPhone. What a Happier, Healthier Life? Then Be Thankful! Now, I know this sounds like pop psychobabble. But, in fact, serious research suggests that expressing gratitude for your blessings will, indeed, help you to be both happier and healthier. A whole bunch of thankful people? Among the studies that demonstrate this connection, one is described in an article from the Journal of Personality and Social Psychology. In “Counting Blessings Versus Burdens: An Experimental Investigation of Gratitude and Subjective Well-Being in Daily Life,” Robert A. Emmons of the University of California, Davis, and Michael E. McCullough of the University of Miami, report on their research. I’ll try to summarize their methodology and findings here. In the spirit of understanding the link between gratitude and happiness, the purpose of this research is to experimentally investigate the effects of a “grateful outlook” on psychological and physical well-being. More specifically, we address whether relative to focusing on complaints or on neutral life events, a focus on “counting one’s blessings” leads to enhanced psychological and physical functioning. There do appear to exist benefits to regularly focusing on one’s blessings. The advantages are most pronounced when compared with a focus on hassles or complaints, yet are still apparent in comparison with simply reflecting the major events in one’s life, on ways in which one believes one is better off than comparison with others, or with a control group. In Study 1, we found that a weekly benefit listing was associated with more positive and optimistic appraisals of one’s life, more time spent exercising, and fewer reported physical symptoms. In Study 2, self-guided daily gratitude exercises were associated with higher levels of positive affect. 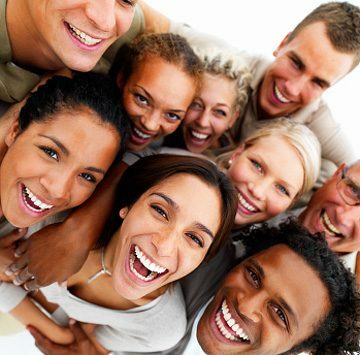 People led to focus on their blessings were also more likely to report having helped someone with a personal problem or offered emotional support to another, suggesting prosocial motivation as a consequence of the gratitude induction. . . . We found that random assignment to the gratitude condition resulted in greater levels of positive affect, more sleep, better sleep quality, and greater optimism and a sense of connectedness to others. In Study 3, we even found that the gratitude intervention led to reductions in negative affect [for those suffering with neuromuscular disease] . . . [emphasis added]. In a nutshell, Emmons and McCullough found that people who considered their blessings and expressed gratitude were happier and healthier. They tended to be more active in helping others. And they also slept better. People suffering from illness experienced a lessening of negative affect. You may be inclined to say that this study simply confirmed common sense and common experience. I agree. I’m not especially surprised by any of this. But I am impressed that when people take time to think about and record their blessings, their lives improve demonstrably and tangibly. So here’s a reason to take time to feel thankful and to express your gratitude: you’ll have a better life. Now, as a Christian, I believe there are other reasons to thank God, beginning with the fact that God deserves our gratitude. Then, of course, there’s the fact that Scripture calls us to be thankful. Then, there’s the positive impact of gratitude upon others. But, if you’re inclined to wonder about whether thanksgiving can make a difference in your own life, now you know. It will make your life better. “But,” you may want to object, “I’m going through a particularly difficult time right now. How can I be thankful when . . .?” You fill in the blank with whatever ailment or challenge or pain is haunting you right now. Is it possible to thank God when life is hard? Tomorrow, I’ll address this question.